Do you love to skate? Are you looking for a fun family activity? Perhaps you are looking for a way to keep you and your little ones healthy and in shape while having fun. 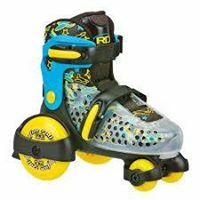 These may be reasons to get your little one out on the skating floor with you at Roller Kingdom! We offer lessons for skaters that are just beginning and lessons for those that are skating competitively! Our beginner skaters will learn basic skating skills such as starting, stopping, backwards skating, and turning. Our more advanced skaters will build on those skating basics. Join our classes at Tyngsboro from 9:30 am -10:00 am on Saturdays. Free admission and skate rental for the 10:00 am-12: 00 pm session is included. Lessons are just $65 a month! Our Tiny Tots Class is from 9:00 am – 10:30 am on Thursdays. Cost for our Thursday morning sessions is $5 and parents can join us for free. We also offer weekly classes on Saturdays for $45 per month (skate rental is included). We offer training wheel skates. We can tighten the wheels to slow down beginner skaters. We have an area in the middle of our skating rink floor for beginners. Parents may wear shoes in the middle to assist in helping their child balance by holding their hand. Parents may also want to skate behind their child, holding them under the armpits to support them. If you are interested in skating lessons for your child, or looking for a fun activity to keep your family in shape, make plans to join us this Saturday at Roller Kingdom! Don’t forget to follow us on Google +, Facebook, and Twitter!